Story A quarter of the deaths on construction sites in recent years have been caused by irregular scaffolding or installation failures. Story The Ministry of Education has encountered many difficulties implementing the Hot Meal Law. 15 years after the legislation - what are the challenges? Coverage Israelis who support the right of return demonstrated on the Gaza border at the same time as the Palestinian demonstration of return. 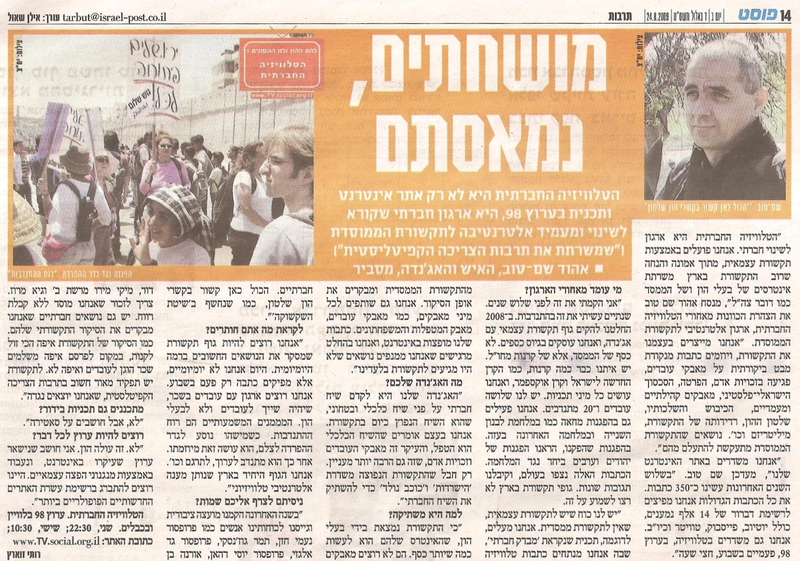 Coverage An interview with Frank Romano: What happens in Khan al-Ahmar falls under the definition of ethnic cleansing and is a serious violation of international law. Coverage Activists visit to the Palestinian village Umm al-Khir. Local residents welcome the expression of solidarity, but need the constant presence of activists. Story The collective punishment that the government leads denies a work permit according to the family name. Is this distorted system not fueling more attacks? Coverage How is it that a tyrant whose responsible for the murder of thousands in the Philippines and compares himself to Hitler is welcome in Israel? Story Yaso Zalalo was recently exposed to the distorted consciousness of the real heroic story of the immigration of Ethiopian Jews to Israel.